No! Please don't tell me this is happening? It can't be true. No. I won't allow it. No matter what Scott Lobdell or Tyler Kirkham come up with in April, 2014, I will never ever, ever, ever, believe DC Comics will play ping pong right-handed, with a group of left-handed sailors. Tut-tut-tut! The nerve of them! To QUOTE Ernie Harwell: 'It's time to say goodbye, but I think goodbyes are sad and I'd much rather say hello. Hello to a new adventure'. I should've guessed the Teen Titans would end up like this ever since our battle with Harvest all those many years ago. 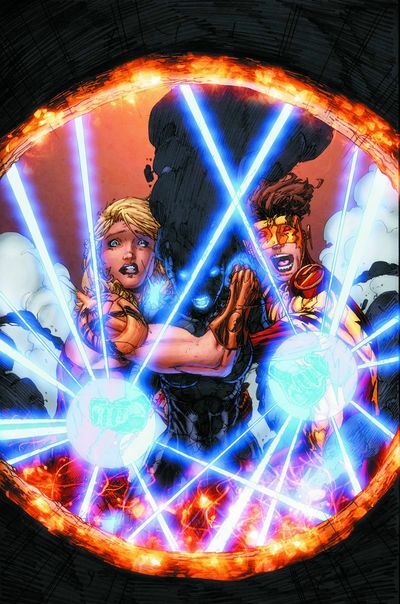 What with Superboy now absent without leave, whilst Kid Flash and Solstice are... well... no longer with us anymore. God bless them both. Wow! What a heart breaking installment of the Teen Titans to peruse. Honestly, dear reader. 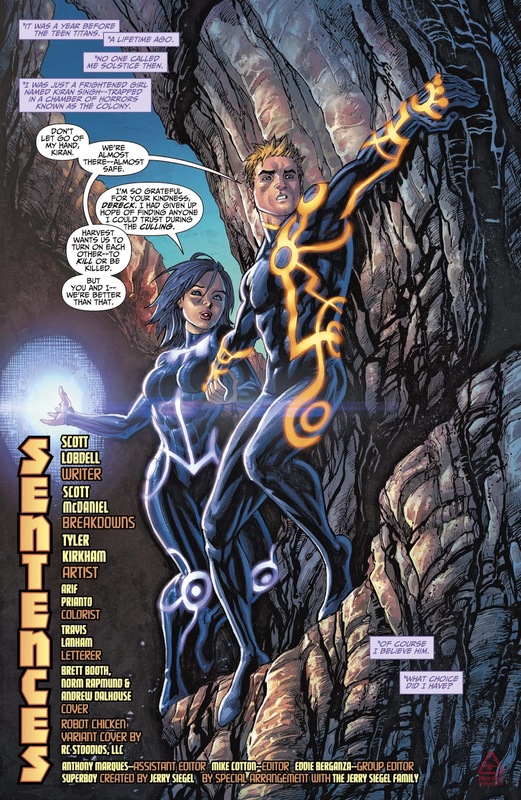 I really swelled up inside when I read that scene were Bart and Solstice... err... went off to parts unknown. Admittedly. I don't think for a single moment this will be the last we see of them both. Well. Not Bart anyway. But that's not to say this penultimate issue didn't feel like a 'last day at school' type of a tale. Thankfully, Scott and company did enhance this solemn tone by allowing the scenes to progress in a rather natural way, without breaking up the momentum by including any superfluous plot-points or pieces of long-winded exposition. Aesthetically it flowed in a very simple manner: From flash-back - to resolution - to reclassification - to whatever else is going to happen next. Oh! And while I'm on the subject of 'whatever else', wasn't it nice to see Red Robin kissing Wondergirl, as well as the re-emergence of Bunker and Beastboy too! Hey! I do have a pretty good feeling this series is going to end on one hell of a high note! Don't you? The only thing I wasn't too keen on would be how the artwork on this adventure was rather inconsistent in places, and did distract when it's tone shifted from a dynamic scene towards a more poignant one. Visually speaking of course. I feel compelled to pair up this tale with the Monty Python 'Galaxy Song', largely due to that scene where Bart and Solstice drifted off into outer space. Now I think I've accidentally answered this section already, dear reader. Simply put, this comic book reminded me of my last day at school because it gave me that empty feeling of clearing out my locker. By now I'm sure you can tell how I felt about this issue of 'Teen Titans'. It was a fairly good issue to follow, as it had a very poignant story-line, some so-so artwork, plus a promise of a great final farewell next month. However, why do you think we're having this 'good-bye' at all? This book isn't doing too badly in the charts. The characters on it have a very large fan following. Plus if push comes to shove, I'm sure DC could have changed the current creative team if that was this books biggest problem. But it isn't its biggest problem, is it? The biggest problem this title faces is all to do with marketing and product placement for another franchise ready in the making. A franchise, I might add, that will come full circle in a couple of week's time, when someone at DC will say to themselves, 'Why don't we bring back the Teen Titans? They were fun'.